Menz FruChocs are something of a South Australian icon so it takes a little courage to start messing with a such a winning formula. But Robern Menz have done exactly that and introduced Raspberry Chocs. 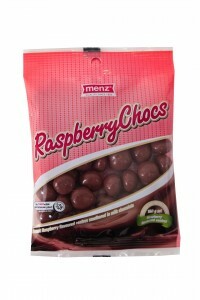 The combination of milk chocolate on the outside and raspberry jelly on the inside has proved to be a hit: the new treat has been trialled in Robern Menz’s own retail outlets with great success. And it’s now available statewide, in Drake Foodlands, Cheap as Chips and Neds. Of course … chocolate and raspberry was never going to work, was it?! As an aside, Robern Menz is a family owned, South Australian company. It was established in 1908 and is now in fourth generation hands. So that’s yet another reason to check out these new sweet treats! Though find them hard to find. Not everywhere sells them. I would like to know how I can buy bulk. Hi Yvette – I have had a look at the Robern Menz website which does have its own online store but doesn’t list the raspberry chocs separately (there are in one of the bundles though). In South Australia there are three dedicated FruChoc shops (Hahndorf, McLaren Vale & Glynde) – I would give one of those stores a call and see if you get hold of some that way! Best of luck!